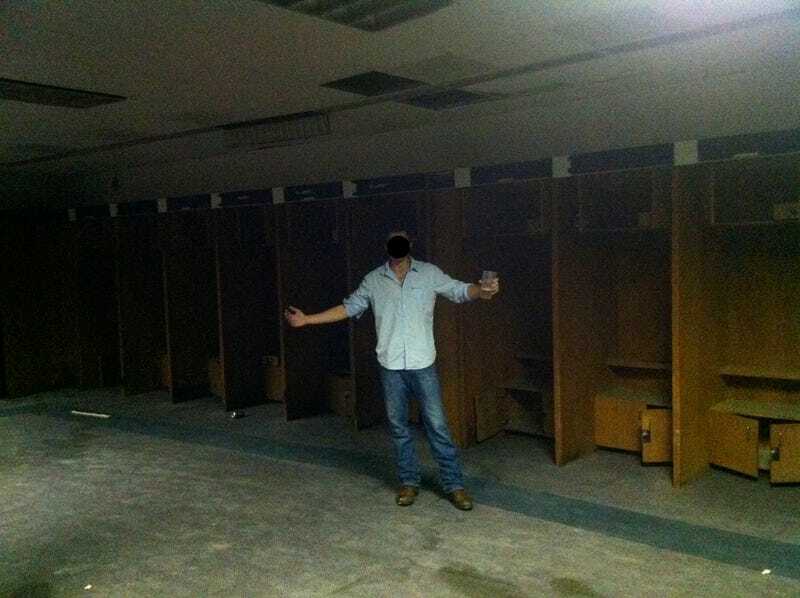 On Reddit, user "loserfame" shares a handful of photos from early 2012, when he and two friends snuck through a gap in the fence and found themselves inside the Astrodome, which hadn't been used since 2003. Beers in hand, they took to exploring the place, from the locker rooms to the field to up on the roof. If you like urban exploration, sports history, or even just contemplating the inexorable destruction wrought by time, he uploaded a full album to Imgur. Note that they brought their beers in with them. As the guy points out in his gallery, they left one of their empty cups in the scoreboard operations room picture directly above. That empty made it into a Houston Chronicle photo (at bottom-right) taken a few weeks later, when reporters were invited in to tour the stadium. The Astrodome still stands unusued—and no one has any idea what to do with it—but it's no longer so trapped in time. It's been cleaned up inside, many of the seats torn out and sold to nostalgic fans, and crucially, it is no longer so easy to breach.